Natural Range: North Guangxi, China. The Yuanbaoshan fir is endemic to the Yuanbao Mountains of north Guangxi, China. Alongside its close relative, the Ziyuan fir (A. ziyuanensis), it was described as a new species to science in 1980. The Yuanbao Mountains are the oldest geological structure in Guangxi, and retain the only belt of mixed coniferous and broadleaf forest in the province. The Yuanbaoshan fir is typically found at high altitudes between 1700-2050m and is associated with a several other conifer species as well as the Chinese beech and Guangxi umbrella bamboo. The species is one of 22 firs found in China, almost half the 50 known species worldwide. Like other fir trees, it is large and impressive when fully grown and is an important feature of the forest ecosystem where it occurs. 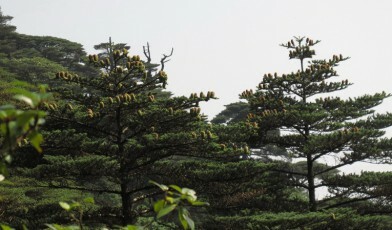 The Yuanbaoshan fir can be distinguished from other firs by its barrel-shaped green-brown cones with outspreading stiff bracts. The Yuanbaoshan fir has an extremely restricted range and is found at a single site (around 20 ha) which is vulnerable to human disturbance. Preliminary work has found that very few seeds have been produced in the past five years. The species is believed to be vulnerable to climate change, particularly a warming climate and extreme conditions, although no studies have confirmed this. Due to its extreme rarity, the species has become well-known as a priority at a national level amongst conservation authorities and professionals. In 1982 Guangxi Provincial Government established Yuanbaoshan National Nature Reserve (NNR) to protect it. However, until recently, the management of the reserve had not been developed and conservation measures were limited, mainly because of the relatively low level of financial support and low conservation awareness locally. Recognising the need to raise local capacity for tree conservation, Fauna & Flora International’s China programme and Guangxi Institute of Botany provided training to technical staff from Yuanbaoshan NNR and helped them secure funding from the Flagship Species Fund in 2012 to undertake an assessment of the species’ conservation requirements. The discovery of seedlings amongst the new population has been encouraging to the project. The next steps are to boost the population through propagation and planting of at least 100 seedlings into the wild, and address an emerging threat of increased tourism to the site, to protect trees from trampling and disturbance. The reserve will also benefit from a regional network facilitated by FFI China. The network supports exchange experiences and knowledge sharing with other nature reserves in southern China. This network will help to support the park management to continue to improve capacity and increase the security of the species once the project comes to an end.